Something is brewing ladies! As we move into the new year, it is time to challenge you into taking long elegant strides toward personal and business success. 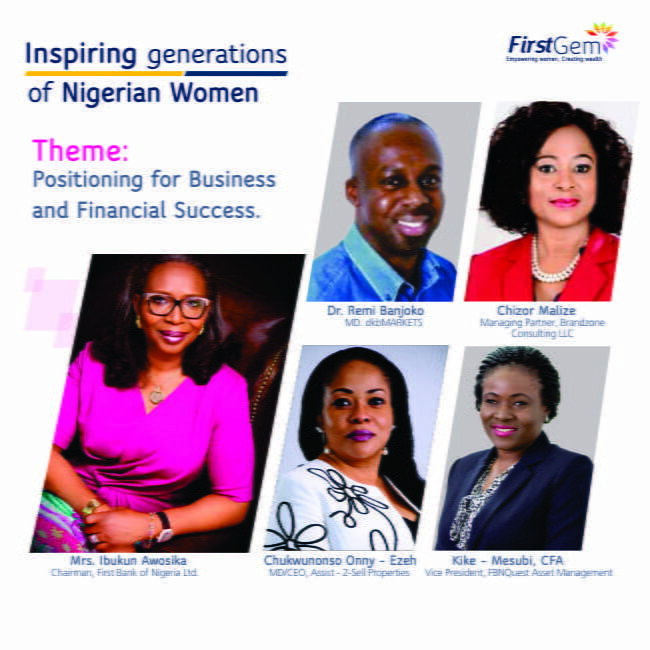 The FirstGem Anniversary event tagged – Positioning for Business and Financial Success – is your opportunity to join the biggest women empowerment community in Nigeria. The key note speakers for this year’s event are Mrs Ibukun Awosika, Chairman First Bank of Nigeria Ltd; Mrs Chizor Malize, Brand Consulting LLC and Mrs Motunrayo Ade-Famoti, CEO Money Stewards. These notable women will provide in-depth insight into economic performance and analysis, tips on wealth acquisition leveraging real estate, stock market and personal branding.